Clutter, clutter, clutter - I really am sick of the clutter around here. It doesn't help that Beth, Tim & Jason moved in with us with all their stuff. But it's not all their fault - we have more than enough stuff of our own around here. That's what happens when you live in the same place for 14 years - you collect a lot of stuff. I keep looking around thinking that it would be nice if I could just clear some stuff out, not just for us living here, but what if - what if (when) - Jeffrey finds a new job and we have to move? How in the world is this place supposed to look good enough to sell? HOW? Yeah, I'm stressing a bit. And, yes, I do know that my house looks better on a bad day than some people's houses look on a good day, but still. There's too much stuff. Before you can organize anything, you need to toss what you don't use, don't need or don't want. Allow at least half a day per room. Pile everything from the room in the middle of the floor. Look at each item critically. Is this something you would buy? Is this something you would be happy with if someone gave it to you? If either answer is no, well, it needs to go. The strategy: Gather four trash bags and assign a category for each. Use for items that are broken or missing their essential pieces. Once you have a pile of throwaways, recycle what you can, and discard the rest in the trash. Designate for things that you don't want but someone else might be able to use. Neatly fold or place in bag to be donated or sold at a garage sale. Collect things you haven't used in a long time but still want. Try moving them to a different part of your home where they may be used more often. Store items you don't use now, but you might want one day. These are things that have sentimental value or would be too expensive to replace. So I guess I need to buy some big trash bags... Or laundry baskets or tubs could work, too. I am recycling a bunch of magazines. That I should have read before. That I can't just toss without first leafing through, just in case I find helpful articles like this. Or recipes I might want to try someday. Flowers and special occasions just seem to go together. Birthdays, anniversaries, graduations - somebody is bound to send flowers. I'm probably one of the few people that doesn't really appreciate flowers. I'm not saying I haven't gotten and appreciated flowers once or twice in my life and probably even sent some. I mean, I like them, it just seems like they cost so much and you only get to enjoy them for such a short time. Maybe that's what makes them so special? I think it's really important to get your flowers from a local florist, in order to get the freshest flowers that will last as long as possible - as well as supporting local business. You'll also save the extra delivery/processing fee your florist will charge for delivery outside the local area - which is probably just them contacting the florist in the delivery area and arranging delivery through them. We've got a local florist here in town we've used a few times, for things like prom flowers. If we wanted to send flowers to someone here locally, we'd go through the local florist. Of course, for sending flowers to someone who lives in another town, the Internet makes it easy to find a local florist in their area. 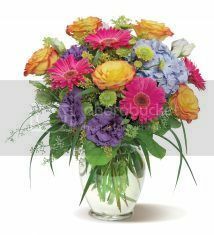 For instance, if you want to send birthday flowers to someone in the Roanoke, Salem or Vinton, VA area, you'd visit the website for George's Flowers and either order online, use their smart phone app, or call to get the perfect gift delivered. They really do have some gorgeous flower arrangements, and they use the latest methods for long-lasting freshness. George's Flowers has been the Roanoke Valley's premier florist since 1981, and they pride themselves on excellent floral design and outstanding customer service. Besides flowers, they also have balloons, candy, and special banners. I did send balloons and candy once - for Jeffrey's 30th birthday! Oh wow, that was a day or two ago... back when 30 seemed old, or at least when I could give him a hard time about turning 30. Our basement smelled like dirty cat litter this weekend. Considering we have too many cats in the house and three litter boxes down there, you'd think that's a normal thing. It's not. The litter boxes get cleaned out every day. (For some reason it seems like I'm the one who ends up doing it. Remember all those years ago when we first got Tillie and Beth promised to take care of her? And she also promised to take care of things when she moved back in with her two cats.) And the Tidy Cats Multiple Cat clumping litter seems to work really well. So why did the basement smell bad this weekend? When we had friends over to spend the night and I would like the house to be nice? Well, I didn't figure it out until yesterday when I went to clean out the litter boxes. We keep a bucket with a plastic bag in it next to the litter boxes. Everything gets scooped into the bag. The clumping litter makes it really easy. But here's where the problem comes in - the stuff that gets scooped out of the litter boxes is the bad stuff, the stinky stuff, the stuff we don't want to see and/or smell - and somebody had cleaned the litter boxes out and left the plastic bag wide open, letting the smell waft out through the basement. It's a simple fix really - just make sure the bag is closed, and keep the smell in. I closed the bag. It took care of the problem. Even if we hadn't been doing it that way for ages - keeping the bag closed in between cleanings and taking it out when it gets full - it seems pretty obvious. Doesn't it? Every year our community hosts its annual Kettle Moraine Days. They've been doing it for a while - this was the 50th year. It's a small-town festival with food to buy and eat, carnival rides & games, beer & bands, fireworks, and a parade. The parade is always pretty good, and we go every year - well, at least every year since we've lived here, except the first summer when we didn't know anything about it, and we wondered why it was practically impossible to get out of town. Main Street is completely shut down until the parade is over. There were several years one or more members of our family walked in the parade - first with Cub Scouts, then marching band, and the library. I think this is the first year I've been able to sit and watch the parade in 3 or 4 years. Somebody's gotta watch, right? And Main Street is always lined with people. The kids are especially excited, because everyone hands out candy, and they get to see fire trucks, clowns, and bands. Now that our kids are all grown up, we have to enjoy watching other people's kids. Jason isn't quite old enough. Yet. I took this video today of the UW-Madison summer marching band. They are always so much fun to watch and a big hit. I love the little guy dancing at the end! Once the parade's over, we head to the park to see what we can see and get something to eat. It's also a big fund-raising opportunity for local organizations like the PTO, Cub Scouts, and Methodist Church, among others, so we figure eating there is a good way to support our local community. Everything actually kicks off Friday evening and runs through the weekend to Sunday at about 6pm, but we didn't get to the park this year until today. We heard the music, though - since the park is only a couple blocks away. And we could've watched the fireworks from our driveway if we'd been home last night. But we weren't. If you're like me, you've got lots of pictures you've taken over the years. Precious pictures of your kids when they were babies, vacation pictures, wedding pictures - your entire life in pictures. The entire bottom shelf of one of my bookshelves is photo albums. And then I started using digital cameras. Those digital images are fairly easy to back up, either by burning them to CD or DVD and/or uploading them and storing them online. The hardest part about it is making sure I actually do it. Those old photos, and the few videos we have, are a bit harder to preserve. Counting on being able to grab an entire shelf of photo albums should we ever have a house fire or some other disaster - like the tornado that went through our neighborhood 2 years ago - is really not a good plan for preserving those memories. I do have all the negatives in two shoe boxes, which might be easier to grab in case of emergency, but still not the best plan. The best plan for preserving those irreplaceable baby pictures would be to convert them (or have them converted) to digital. For the best quality, I'd say using a service like ScanDigital.com would be the best - and the easiest. All you have to do is place your order online, ship it to them, and they'll do all the rest. They individually inspect and clean each picture and then scan them with the highest quality equipment. Once scanned they'll even edit each image, including cropping, rotation, color correction and red-eye removal. Then they'll burn them to CD or DVD and send them to you, along with all your originals. They'll also archive them online where they'll be stored and protected forever. They'll also be a whole lot easier to enjoy and share. Besides photo conversion, they also offer negative and slide conversion as well as video and 8mm film conversion and many other services. Your photos and videos are full of precious, irreplaceable memories. Check out what ScanDigital.com can do to help you preserve those memories. This is a Sponsored post written by me on behalf of Western Union for SocialSpark. All opinions are 100% mine. This post is being paid for by my sponsor Western Union. Western Union has made it really easy for anyone to send greeting cards and monetary gifts. Simply visit WUGift.com and choose greeting cards suitable for a variety of occasions including anniversaries, birthdays, congratulations, holidays, thank-you’s and more. Add a personal greeting to be printed inside the card and load any amount from $5 to $100 onto a Mastercard debit card. Western Union will even mail it First Class for free. If you need to get it there faster, you can choose Fed Ex shipping, though that is not free. After you've completed your purchase you'll also have the option to call 1-866-953-6490 and record a FREE personal voice message which your recipient will hear when they activate their MasterCard. For your recipient, the gift card is really easy to activate - either by visiting WUGift.com or by calling the toll-free number 1-866-953-6489. I am not sure if they will hear your recorded greeting when activating through the web page, but hopefully Western Union has thought of that, too. I think the personal recorded greeting is a really nice extra touch. Your recipient will be able to use the card anywhere debit Mastercard is accepted - in stores and online - and it's really easy to track the balance by going online to WUGift.com or by calling the toll-free number. The card is fee-friendly - absolutely NO fees unless the card is not used for 12 consecutive months, and that's probably not going to happen. After all, money is one gift that everyone appreciates! If you're looking for an easy way to let someone know you're thinking of them or just don't know what to buy for that special occasion, a Western Union gift card may be just the thing. Receive 25% off the $5 gift card fee when purchasing a gift card at wugift.com. Limit one (1) coupon per transaction. No cash redemption value. Cannot be combined with any other offer. Void where prohibited. Offer expires 9/1/2012. Anyway, I recently received a set of these insoles from BzzAgent - an entire pair - so this time I tried them. I put them into a pair of heeled sandals and wore them to a wedding reception. First of all, these really surprised me because I thought they worked by giving me a gel cushion under the balls of my feet, which is where my feet always hurt when I wear heels. Yes, there is a slight cushion there, but it's the gel arch that shifts pressure off the ball of your foot that really makes these work. It lets the arch of your foot take some of that pressure and spreads it out over more area - meaning less pressure and less pain in one place. The insoles are clearly marked so you get the left one in the left shoe and the right one in the right shoe, so that the arch support is in the right place. I did not dance the night away or spend the entire night on my feet at that wedding reception - because my husband was the DJ - but I was on my feet quite a bit, helping him unload stuff, walking around, etc., and these insoles definitely made a difference in the way my feet felt by the end of the night. I wore the shoes again yesterday, all day long, and I was again impressed by how well these insoles worked. I don't think I would want to run a mile or be on my feet all day long, even with the insoles in my shoes, but I do think they help a lot to make heels more comfortable. The insoles have a good adhesive that keeps them in place, which is very important, but it doesn't stick so tightly that you can't adjust the placement to get just the right fit. They're also supposed to be removable without any damage to the shoes, which is also very important - because I'm not sure comfort is worth ruining a good pair of shoes. It would be nice if I could move the insoles from one pair of shoes to another - so I can always have them in whatever pair of shoes I want to wear - but I'm afraid the adhesive would stop working before long from being stuck and unstuck, and then they wouldn't stay in place. I guess I'll just have to start by buying a few at a time and putting them into the shoes I wear most often. Be sure to grab the $2 coupon available on the Dr Scholl's website before you run out and buy some of your own. Disclosure: I received a product sample from BzzAgent. I was not required to give a positive review, and all opinions are mine. This is a Sponsored post written by me on behalf of Wave Home Solutions for SocialSpark. All opinions are 100% mine. We never had a basement until we moved into this house, so we had no idea about moisture issues - until things down there started smelling like mold and mildew. We didn't think our basement was damp, but I guess that's just the nature of basements - and crawl spaces, though I never ventured into the crawl space at our previous house. We went out and bought a dehumidifier as soon as we realized that something needed to be done about the moisture in the basement, and we've been using one ever since. I thought that was good enough until I started reading about what Wave Home Solutions does. Apparently dehumidifiers dry out the air but they do not ventilate so you still have trapped toxins, pollutants and stale air, and those pollutants can flow upward into the main part of the house. These things can lead to something called Sick Home Syndrome which is characterized by respiratory ailments, asthma, headaches and other symptoms. A system from Wave Home Solutions not only dries the air, but also provides the ventilation needed to get all the bad stuff out of your house. The system draws the damp, polluted air from the lower level of the basement or crawl space and expels it outside. This creates the necessary air exchanges needed for a healthy home. The Wave Home Solutions system constantly and automatically monitors relative humidity and adjusts for maximum results. Optimum conditions are maintained year round and the system costs pennies a day to run, is maintenance free, and satisfaction is guaranteed. They say that dehumidifiers can cost up to $50/month in electricity and, of course, there are all those buckets of water to empty. No more of that with one of these home systems. This is not something that I've heard before, but it does make sense. If it would help me avoid some headaches... And Beth is doing better since she moved back home, so I think their old apartment definitely had worse air quality than we have here, but she still has some respiratory problems that I'd love to see go away. It would definitely be something worth checking out. WAVE Home Solutions is dedicated to keeping families healthy and comfortable with a variety of cutting-edge, cost-efficient, eco-friendly solutions. It's a family-owned and operated business that was founded in 2001, so they've been doing this for a while. Be sure to check them out to see what kind of solutions they can offer for your home and family. Now that summer is practically here, we'll be spending more time enjoying the deck. We had dinner out there last night! It's such a pleasant place in the evenings. And in the mornings, it's a great place to enjoy my coffee. While I was appreciating how nice the deck is and what a pleasant place it is to spend time, Jeffrey was noticing some things that need taken care of. He's noticing screws that need tightened and things like that. Then he and Tim started talking about different deck materials and how long the deck will last, and I stopped paying a whole lot of attention. I just want a nice deck to spend time on! I trust Jeffrey to know what needs done and when. Seriously, I do know that it's important to take care of the wood so that it will last a long time. You can't just build a deck and then ignore it. That's why the guys used some kind of cleaner on all the surfaces and then stained the whole thing. We stuck with a transparent finish with just a hint of color, though there are lots of colors to choose from too. We have neighbors that chose brown and red for their decks. The important part is that these wood finishes protect your wood from the elements, allowing you to enjoy your decks and wood fences for many years to come. I honestly do not know if Flood® Wood Care is the brand Jeffrey used for our deck, but knowing that brand has earned the reputation as “The Wood Care Specialist” and knowing he'd want to take extra special care of the deck and pergola after working so hard to build it, I wouldn't be surprised. I think that Flood® is the best solution for any wood care projects you may be taking on this summer - because you definitely have to take care of your wood, and while you're doing it, you might as well do it right. Right? Or even better would be to have somebody else do all the work! How, you ask? Enter the Take it Easy Sweepstakes. If you win, Flood® Wood Care will provide all the supplies AND labor to prep and stain your deck PLUS $2,000 for the deck party of your dreams. So be sure to enter. All you have to do is click the link and fill in all the required information. Please note that to be eligible to win, you must be a resident of the United States, and you must be the owner of a house with a wooden deck. They will not be building you a deck. They will be using Flood® Wood Care products to make sure you get to enjoy the deck you have for a long time! Limit one entry per person/email address. You'll invite me to your party, won't you? I saw these three on the couch yesterday evening, and I just had to take a picture. Jason was just so happy to be between his daddy and mommy. I'm often occasionally asked to review products, and I always jump at the chance, because who doesn't love trying new stuff? But then when it comes time to write the reviews, I always have a hard time. What do I say? How detailed do I need to be? Etc., etc., etc. One of these days I just need to record myself when I'm telling people my husband about the products. I usually have a definite opinion about what I like, what I don't like, and why. But when I sit down to write the review, my mind goes blank. Arghhhh! So, this evening I was going to post a review on Bzzagent - for Dr. Scholl's® For Her High Heel Insoles (which I really, really liked, by the way) - when I noticed they had a helpful link to tips on writing a good review. I clicked, yes I did, and I found this helpful list - which, of course, will be great for writing that review but will also be a helpful resource to have on hand for all the other reviews I agree to do. Be detailed: Include at least 3 key things someone would want to know. Be specific: What exactly made you give the rating you did? Be rational: Explain why exactly you did or didn’t like the product. Be yourself: Include personality and share your background/expertise for context. Be respectful: Don’t use offensive language or attack other reviewers. Be honest: Especially about free samples or affiliations with the product. Now go share your wisdom and experience with the world! You know how much work is involved when you're planning a trip - visiting the tourism websites, requesting travel guides, trying to digest all the information so that you can make the most of your trip. Where to go, what to do, where to stay, what to see - sometimes it can be overwhelming. Or my personal regret - grabbing the brochures or the travel guides and then finally sitting down to read them after the trip - at which time I find all kinds of fun things I would have loved to do and see. VisitPA.com, the official tourism website of Pennsylvania has come up with an awesome idea - pre-planned roadtrips. They call it Roadtrip-a-Matic, and it's like they've got all these pre-packaged trips all boxed up and waiting for you. Not that you're limited to just what they've planned for you, but it's certainly a great place to start. It's like asking the locals what they'd recommend you see and do. Simply browse the website and look through the dozens of ready-to-ride roadtrips available. They've got trips for visitors looking for outdoor experiences, small town charm, historic landmarks, shopping, the best in PA beer, wine, and food, and so much more. When you find a roadtrip you like, you can download and print the pdf. It tells you where to go, what to do, where to eat and where to sleep - all the planning! How easy is that? Of course, just because you printed the trip out, you're not commited to do everything on the list - and you can spend more or less time. It's really up to you. There is also a whole list of worthy detours you can make along the way and additional resources for more information. The only thing I don't see is a map or directions, or at least an address for each destination so visitors can plug that into their GPS or Google Maps on their cell phones, which would be really helpful. There aren’t many places where you can get a complete education that covers art, natural science and history like you can in the Pittsburgh area. This road trip will give you a lesson on two of the most renowned artists of our time in Andy Warhol and Frank Lloyd Wright. You will also learn the importance of economics during our shopping excursions. Nature will be front and center as you scale Mount Washington and visit one of Western Pennsylvania’s beautiful state parks. And, through it all, you will come face-to-face with history at every turn. Buckle up and hit the road with us as we explore all that greater Pittsburgh and Western Pennsylvania has to offer. It would be a fun getaway for Jeffrey and me. Maybe we could even find a golf course along the way - as long as he's scaling that mountain with me! Be sure to check out Roadtrip-a-Matic on visitPA.com and pick out your own roadtrips. Which one most appeals to you? I click open a Facebook message. A friend has sent me a word search and tells me to let my eyes fall onto the image and take note of the first three words that I see. These are the words that best describe me, she promises. I shrug, take a sip of coffee, and glance at it. “Funny,” “broken,” and “love” are my words. I don’t give it another try, though. The words I read the first time are just right considering how I’ve been spending my days for the past several months, thinking and writing about the family in which I am the wife and the mother and about my family of origin, where my story began. Funny, broken, love - sounds like family. MOMumental: Adventures in the Messy Art of Raising a Family is about my own missteps and small victories as a mother. Over the years, after beginning my parenting journey – as so many of us do – staggering under the weight of the expectations I had for myself, I’ve loosened up. I’ve come to learn that none of us is perfect. We all fail, misunderstand our kids sometimes, and mess up in countless ways. In MOMumental, I share stories of some of my “epic fails” as a mom. The dire messages that flash on the computer or television screen that warn what a mother absolutely must or must not do no longer hold me tightly in their grasp. I now look at myself – and at other mothers – with less judgment, knowing that we all work it out, there is no manual for motherhood, and that the most important thing in raising kids is to be authentically connected with them. I hope in sharing my own personal – and often quite cringe-worthy – story in MOMumental, other parents will show themselves, and other parents, more grace as we raise our children. To me, those three words – funny, broken, and love – are great ones to reflect on when I think about the gift of family. To be able to enjoy our kids, repair our relationships with them when needed, and most of all to love our children like crazy covers a multitude of parental crimes and misdemeanors. Wishing you all the best in your own messy family-making adventures! Celebrating the joyous art of being a mother, MOMumental offers an inspiring, honest, and infectiously humorous look at the perils and pleasures of raising a family in the real world. Once a devout believer in the myth of the perfect mother, author Jennifer Grant now has a more realistic yet still upbeat view of parenting and families. Instead of focusing on creating a conflict-free home, raising picture-perfect kids, and being an ideal mother, Grant offers a wiser and more down-to-earth way to love your children that makes room for mistakes and imperfections. She says, "I share stories about family life and how I've come to appreciate the mess of it. I am grateful for my own happy, idiosyncratic, and imperfect family." MOMumental is one mother's account of the unpredictable, creative, sometimes hilarious, and always rewarding process of raising a family. It's filled with funny and poignant stories from her everyday life--a life that mothers everywhere can identify with. I very much enjoyed this book. We live in a culture that puts unfair pressure on moms to do everything exactly right - or we as moms put that pressure on ourselves. We grow up with our own ideas of family and parenthood, how it's supposed to be, how we want ours to be, how our kids and our house is always going to be perfect, etc. And then, when it doesn't happen that way, we think we're failures. Sharing stories from her own background and family life, Jennifer Grant shows in a very real way that being a mom is never what you might expect - and that's OK. No mom is perfect, and what matters is what we do most of the time and learning to relax and connect with, accept, cherish and enjoy our kids. My kids are pretty much grown now, but I can always stand to be reminded that things are never going to be perfect. Actually, I'm reminded of that often, what I need is to be reminded that imperfection isn't always a bad thing. For moms with babies and young children, I would definitely recommend this book. It's not a how-to kind of parenting book that will teach you how to be a great mom, but it is a book that will leave moms with the knowledge that they are not alone. Other moms have gone through and done the same things - and their kids turned out OK.
You can read the first chapter of MOMumental now, and the book is available now on Amazon and Barnes and Noble. Look for a guest post from author Jennifer Grant and a chance to win your own MOMumental Book in the next few days. Note: I received a free copy of MOMumental for review from Worthy Publishing. All opinions are 100% mine. I've always been a fan of Quaker oatmeal and Quaker granola bars, and now I'm really looking forward to trying the new Quaker Soft Baked Bar. They come in two flavors, Banana Nut Bread and Cinnamon Pecan Bread. Both sound really good, but I'm leaning toward the Cinnamon Pecan Bread. It just plain sounds good! I really love cinnamon in about anything - always put it in my oatmeal - and it's also really good for you. These bars contain real fruit and nuts and are easy to grab when you're on the go. Or, for a special treat, heat them in the microwave for a fresh-baked taste. Because I'm home in the mornings, I have a lot of different things for breakfast. I have time to cook some oatmeal or make an omelet if I want. I can even enjoy my own fresh-baked muffins or breads if I want to take the time to make them. However, the rest of my family is often running out of here in the mornings, oftentimes without eating anything for breakfast. (Jeffrey does usually have something he eats at work) Having some of these Quaker Soft Baked Bars on hand for them to grab and take with them would be so handy and a great way to make sure they start their day with some wholesome food. They'd be more likely to eat something if it's handy, easy to take with them, and tastes good. Quaker says, "With flavors you'll love and nutrients to help fuel you, you'll be a morning person in one delicious bite." I don't think even these will turn Beth into a morning person, but I would like to see her eat something in the mornings - something that's not junk. While I think these bars will make a great breakfast snack, I think they'd also be handy and nutritious for any time of day. I especially like having a granola bar or something like this that I can grab and take along when I go grocery shopping. That way I have something to eat if/when I get hungry, something to give me the energy to finish my shopping - and you know what they say about shopping on an empty stomach! Now that school is about over for the year, moms everywhere are dreading those two words - "I'm Bored"
Yep, the kids are so excited for summer vacation. No getting up early. No classes. No homework. Nothing to do. It's all good for the first day or two, and then boredom sets in. AMF has the answer! Kids bowl free all summer long! That means now through September 3, kids 15 and under can bowl two free games every day. Free bowling is available 7 days a week until 8pm. All you have to do is visit the AMF Summer Unplugged page, find a participating location, and fill out the simple registration form. Every week they'll email you vouchers for two free games for each child per day. Whether you go every day or just a time or two during the summer, it's a great deal and a great way to beat the heat and the boredom. And if you want to bowl too - because it's more fun that way! - or if your kids are older than 15, AMF has a deal for you too. For only $29.95 you can purchase a Summer Pass that enables you and up to 3 family members 16 and up to bowl 2 games every day all summer long. Note: I was planning to post this earlier, as part of a campaign through One2One Network, and I would have been entered to win some kind of prizes for doing it. But I was thinking I had more time - for some reason the wrong date got stuck in my head, and I just kept putting it off. So I will not be eligible to win anything, but I still wanted to let you know about this - in case you haven't heard about it on the radio or seen it somewhere else online. I love free (or very cheap) entertainment! And I strongly believe in getting out and doing things with the kids as much as possible - enjoy them while they're young and make memories. Plus, now that smoking is not allowed indoors (at least here in Wisconsin), it's actually possible for families to go bowling together without worrying about all that nasty smoke. I always thought bowling should be a family activity, but unfortunately the smokers did their best to discourage that! Not anymore!! I'm just wishing my kids weren't all grown up and off doing their own things and living their own lives, because I'd love to include bowling in our summer activities. Free Kids Bowling At AMF All Summer Long! This summer, not only can you save money on gas and hotel rooms and see some of your local sites - or just hang out in the backyard with the kids - you could even get paid to do it. How, you ask? By entering the It Pays to Vacation at Home sweepstakes from Dollar General and Clorox®. 20 lucky grand prize winners will be selected to receive a $500 "paycheck" and 100 lucky winners will win a $25 Dollar General gift card. Simply visit dollargeneral.com to register. Then, once you register, you can also play the “Wipe To Win” game for the chance to win a $10 Dollar General gift card. You take a virtual Clorox® Disinfecting Wipe and wipe the virtual fridge to find out if you won or not. I played. I didn't win - but I can try again tomorrow. There will be 100 instant win prizes given away. Be sure to enter the It Pays to Vacation at Home sweepstakes for your own chance at some of the prizes, and remember you can pick up all your favorite Clorox® cleaning products at Dollar General - Pine-Sol® Multi-Surface cleaners, Clorox® Disinfecting Wipes, and Clorox® Liquid-Bleach, to name a few. (Interesting - as I'm typing this, there's a commercial for Clorox® Disinfecting Wipes on tv.) Just rember that, even if you are staying home, you are not allowed to spend your entire vacation cleaning!! That wouldn't be a vacation, would it? This contest runs now through June 24, 2012. Good luck! I just got a package from efoods Direct. They asked if I'd like to try their meals, and after reading the info, I was only too happy to try them. Basically, what they offer are delicious and nutritious food in a convenient and easy-to-store package. 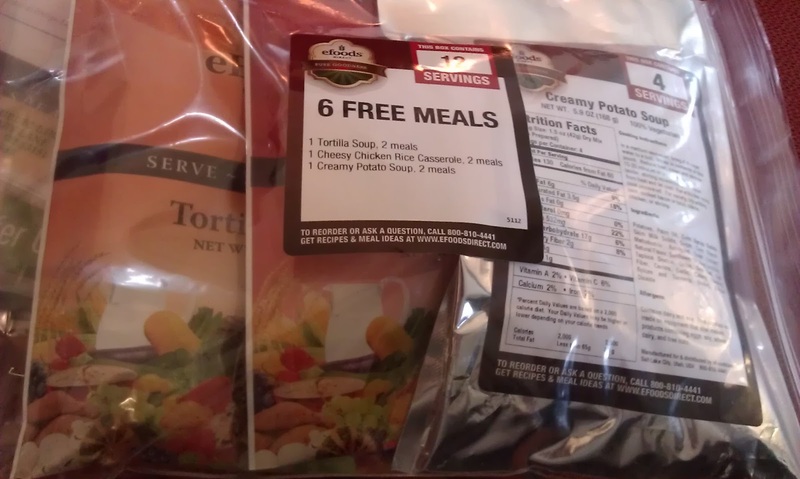 Dehydrated products are packaged as complete Quick-Fix meals. Simply boil water, simmer and serve a healthy, delicious hot meal no matter where you are. 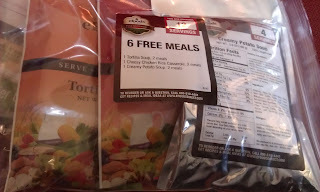 These meals would be great in all kinds of situations - stock the pantry and have them on hand for emergencies, take them camping, or I'm thinking they'd be great for a certain college student I know. He has a hard time finding healthy food on campus, so I'm always looking for easy solutions - something he can fix in a dorm room without too much trouble. These would be great. Quick Fix: We promise our meals are quick and easy—just add water to rehydrate the food! Our true Quick-Fix line provides packets of complete meals that can be served in less than 20 minutes; Reserve Paks (1-year supply) products are individual ingredients you can use with your own recipes. Extended Shelf Life: We promise our products are storable for up to 25 years. Daily Use: We promise that all of our products can be served daily. They want their products to taste great, be universally appealing, and provide superior nutrition. Their foods are a good source of fiber, contain no trans-fat or hydrogenated oils, contain no MSG, contain no genetically modified ingredients, contain no artificial colors, flavors or preservatives, and they even offer gluten-free options. They're soy-free, irradiation-free, and use oxygen-free packaging. And they're made in the US! There is quite a list of positives here - I did not have time to list them all, so be sure to check them out for yourself. I love that they are committed to providing healthy, easy to prepare foods that can be stored for an extended period of time. I got the Tortilla Soup, Cheesy Chicken Rice Casserole, and Creamy Potato Soup to try. I am really excited to try them to see if they really do taste as good as they say they do. If these products sound like something you'd be interested in, be sure to check out efoods Direct. They've got some specials going right now- Save 50% on a 7-day supply by entering code FOOD50 or save 40% on a 5-day supply with code FOOD40. I'll be posting a review once I've had a chance to try them - or my son just came home and claimed them. He's leaving Monday for his summer internship, and he's going to need to eat... He promised to write the reviews, so that will be fun. I told you they'd be perfect for a college student, even in summer! He obviously doesn't have time to actually cook.